Green ‘Easy Street’ coat from C/MEO COLLECTIVE. Crafted from a warm, wool blend and cut for a straight fit, the long-line coat comprises a notch lapel collar, single button fastening and long sleeves. Fully lined, the coat is complete with two fold over front pockets and two splits to the thigh. Main: 50% Wool, 50% Polyester. Lining: 97% Polyester, 3% Elastane. Model is 175cm/5'9 and wears a size S/UK 8. 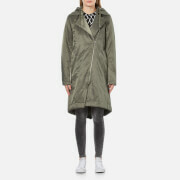 Women’s ‘Profile’ grey winter parka from Swedish brand Cheap Monday. Crafted from a cotton blend with a subtle sheen, the long cut parka is detailed with an overlapping, asymmetrical zip-up front, four pockets with snap-button closures and a detachable drawstring hood. The padded parka is lined with quilted fabric for added warmth. Complete with lapel details, zip cuffs and a fishtail rear hem. 57% Cotton, 43% Polyamide Model is 175cm/5'9 and wears a size S/UK 8. Women’s black ‘Proud’ wool coat from Swedish brand Cheap Monday. 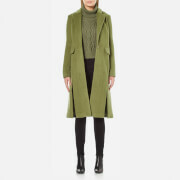 Crafted from a smooth wool blend, the knee length coat features an overlapping zip-up front, a notched lapel collar and adjustable straps with metal D-ring details. The front of the trench coat features two chest pockets and a large patch pocket to the left side. Complete with adjustable cuffs, a soft lining and a single internal welt pocket. 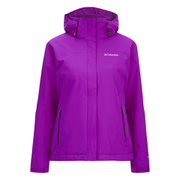 55% Recycled Wool, 35% Polyester, 10% Other Fibres Model is 178cm/5'10 and wears a size S/UK 8. 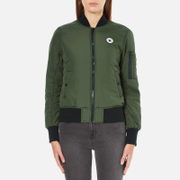 Women’s ‘MA-1’ reversible bomber jacket from Converse. Crafted from technical fabric, the jacket features a solid green design on one side and an all over camouflage print on the other side. Fastened with a full length zip closure, the jacket features two snap button front pockets and a zip pocket on the sleeve. Complete with ribbed trims, All Star brand embroidery on the chest and a signature brand tab on the side seam. 100% Polyester Model is 178cm/5'10 and wears a size S.
Black faux leather biker jacket from French Connection. 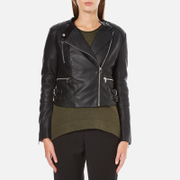 The ‘Decade’ biker features classic traits, from the asymmetrical zip fastening to the multiple zipped pockets. Comprising a press stud fastening to the neck and cut for a slightly cropped fit. Complete with quilting details to the sleeves and adjustable buckle trims. 100% PU Model is 178cm/5'10 and wears a size UK 8. 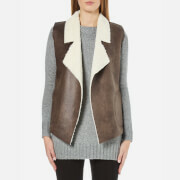 Women’s ‘Winter Rhoda’ gilet from French Connection. Crafted from faux suede with faux fur trims, the slip-on gilet is cut for a relaxed fit. The sleeveless jacket features a wide, notch collar and is complete with two side pockets and a centre back seam. 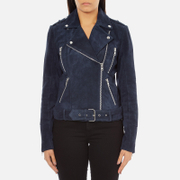 100% Polyester Model is 178cm/5'10 and wears a size S.
Women's regular fit biker jacket from Gestuz. Crafted from soft, distressed-effect suede to create a rugged, well-worn aesthetic, the 'Daya' showcases a lapel collar, asymmetrical zip fastening and a pin buckle belt at the hem. Four zip pockets and shoulder epaulettes also feature. Complete with zipped cuffs, silver-toned hardware and seam detailing throughout. Outer: 100% Suede. Lining: 100% Polyester. Model is 173cm/5'8 and wears a size EU 36/UK 8. 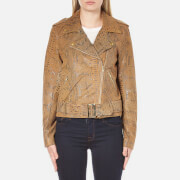 Women's leather jacket from Gestuz with embossed snakeskin print. Cut from genuine leather with a boxy fit, the 'Masha' jacket incorporates classic moto details, including a notched lapel collar, asymmetrical zip fastening and shoulder epaulettes. Complete with two zipped pockets, zipped cuffs and adjustable buckle strap to the hips. 100% Leather. Model is 175cm/5'9 and wears a size EU 38.